So, as some skeptics out there suspected, that whole Bake Your Own Carving Block tutorial was an April Fools joke. A complete hoax, through and through. Oh, there were elements of truth to it--the better to make it believable. For instance, when I wrote, "This tutorial has been more than a year in the making," that was the honest truth. I had the idea for the tutorial about a year ago, and it took me that long to save enough shavings to create a tutorial that would look legit! And when I wrote about the equipment: "Amanda found ours at a Japanese dollar store and our total expense was less than $10!" --that too was completely true. But those are about the only two true statements in the entire tutorial. The rest was a complete hoax. 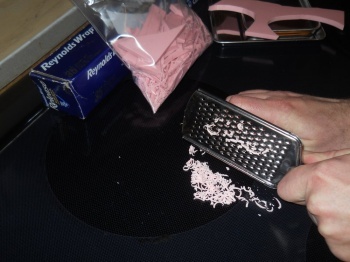 Real pink stuff, really being shredded with a cheese grater. Real pink stuff, when I got too lazy to shred enough pink stuff! In step 2, when I sprayed the pan with DEET--this is true. I really did do this. Why did I use DEET? What made me even think of using DEET? That was the first question Amanda had when I showed her the tutorial. "DEET? That's crazy!" she told me. I actually went through our kitchen looking for Pam. I figured it needed a food release spray, but when I looked for it, I couldn't find it anywhere. Were we out? Was it hidden behind the cinnamon and I was just overlooking it? I didn't know, but then I realized I'm just making a fake tutorial anyhow. Who the heck cares? It just has to look like I sprayed something on it! So I started searching the kitchen for anything "spray-able," and you know what I found? Nothing. Absolutely nothing. Then I thought I could use one of those water spritzer bottle thingys, but I couldn't find any of those in the house either. And then I remembered my DEET. It came in a small bottle that was sprayable. And it clicked immediately--what a WONDERFUL idea!!!! I was going to try to use something else other than food release spray and pretend it was a food release spray, but DEET keeps bugs away--that could actually be a good thing for our little rubber stamps! Who cares if it worked? It looked good and it sounded even better! Perfect for an April Fools joke! already been washed off and the tray dried again. I took a few photos of the DEET-covered tray, then immediately washed off the DEET and dried the tray. It had served its purpose. In steps 5 and 6--it's actually still real when I turned on my toaster oven* to 350 degrees and waited for it to warm up a bit. I wanted that orange glow to show that the toaster over really was on and quite warm. When it glowed sufficiently, I put the tray in and took a few photos. The pink stuff really is still in there, but as soon as my photo shoot was over (perhaps after about 1 minute), I turned off the toaster oven and removed the tray. It's not until the tutorial gets to step 7 when the hoax really crosses from fact into complete fantasy. 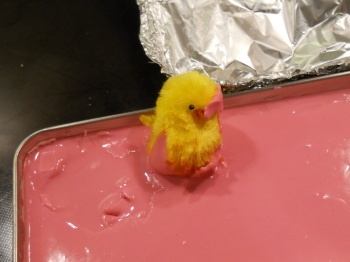 That's when I bring out the "melted" pink stuff. Since I didn't have any melted pink stuff--and I'm not even sure that it would melt (but I haven't eliminated the possibility either)--I needed something else. Something pink and liquid-ish. Anyone care to take a guess at what I did use? If you guess Pepto-Bismol, you guessed correctly. =) If you've got the runs, this concoction might help you out! But for carving purposes, it's absolutely terrible! 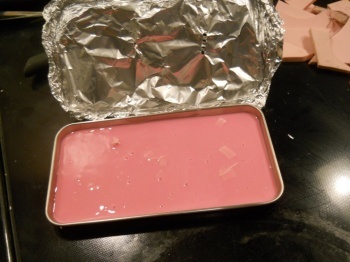 pink stuff to make it look "mostly" melted. So I dumped out all of the pink shavings and filled up the tray with Pepto-Bismol. 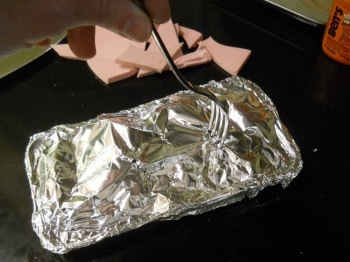 Then I threw in a small handful of real pink stuff to give it that "mostly" melted and lumpy look, mixed it in real good, then placed the aluminum foil behind it as if I had just opened it for the photo. 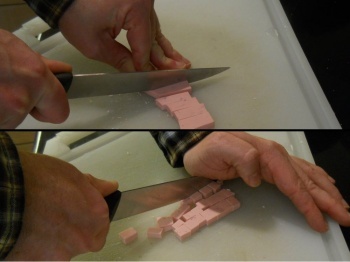 Removing real air bubbles from the Pepto-Bismol. Next I wanted a photo of the "finished" product, so I used a fork to pull out most of the real pink shavings in the Pepto-Bismol. The smaller pieces that sank to the bottom I didn't worry about--you couldn't really see those. I was more worried about the bigger pieces that gave a lumpy appearance and that could actually be seen. 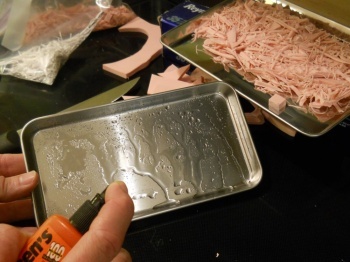 But when it was done, I was a little concerned by the fact that the Pepto-Bismol had a TON of enormous air bubbles! It didn't look flat or carvable at all! I did, in fact, try popping them with the end of a toothpick, but they were stubbornly resistant to popping, which is when I pulled out my spoon and started "skimming" the biggest bubbles off the surface. It looked pretty good in the photo, but if you really zoomed in closely, you'd see all sorts of smaller air bubbles I never did get. I was almost done with the Pepto-Bismol. Before I dumped it out, though, I wanted to get Marjorie involved. 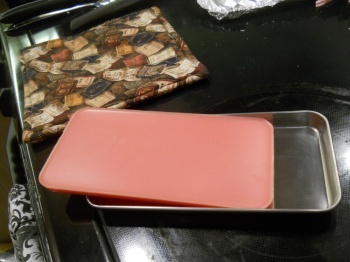 I let the Pepto-Bismol tray set out overnight--mostly just to see what would happen--and a very thin, slight crust formed on it by morning. Which was an awesome effect! 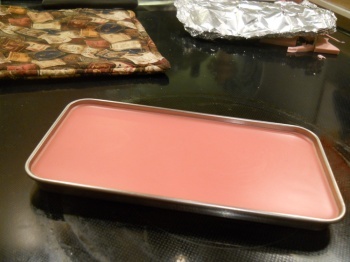 I thought it made the pink stuff look like it was already cooling (but hadn't cooled completely) giving it a sense of legitimacy, and even made it look less like the Pepto-Bismol that it really was. in this photo. It's actually an effect I really liked and wanted! moved her to the side so the "hole" was quite obvious. pink stuff was switched out with strawberry-scented candle wax. By step 10, I needed to show a "finished" product. The problem with Pepto-Bismol, as you might imagine, is that it's a liquid. It's always a liquid. It's a little hard to "pop" it out and have it look carvable. Amanda came to the rescue here, though--she found strawberry-scented candle wax that was just the right shade of pink. 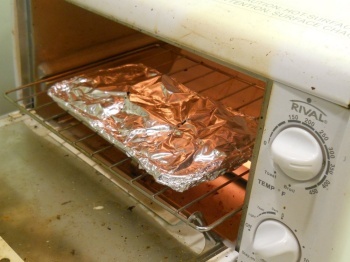 * No toaster ovens were harmed in the making of this hoax. Excellent! I was completely sucked in and ready to give it a go. I guess I'll just have to get my blue feather now. You fooled me! I carved some stamps last night and started saving my scraps--LOL! I'm feeling like such a sucker right now! I have laughed all through your explanation.... I hope you had as much fun doing your hoax as I have had reading all your substitutions!!! Bravo for another fun April Fools antic! Blue feathers were a joke as well, and meant as a decoy. However, technically speaking, that link really did work! =) So I'm not ready to call that one an "April Fools" joke. A joke, yes, but it can't be an April Fools joke if it's really true, right? I can't believe this was a joke! Well played, Ryan. Now I have to forward this on to the people I sent the original to so they don't try it!!! Because I was skeptical, I read your tutorial aloud to Old Blue, he said, "Bet that's Pepto Bismol in that pan". Smart guy, that Old Blue! I figured that you didn't use food spray, thinking it would attract animals (but I was thinking "I wonder if WD40 would work...?"). 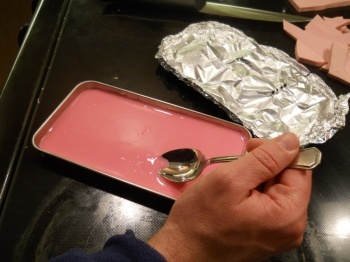 I also thought the melted product looked a bit like jello made with evaporated milk. Well done, Ryan! The two-fer-one this year was brilliant! So . 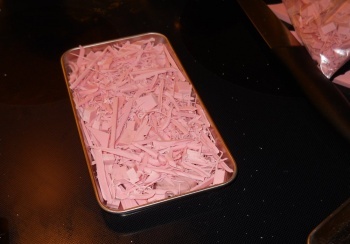 . . has anybody tried dehydrating pepto bismol to get a carving block yet? I'm thinking maybe 3 hrs @ 140 degrees? Well, I'm disappointed. The Deet did seem a bit odd, but understandable...the rest seemed rather doable. I was ready to give it a try. Now what do I do with this cheap little toaster oven that I went out and bought? Ya got me good. After curiously reading this, I said to myself omg this really worked then I scrolled up to the top and saw the note. I was even going to add color to it, hahaha!